Should LACBA Encourage People Not to Hire Lawyers? Hypothetically…what would you think of the County of Los Angeles spending funds on providing free advice to people on how to fill out their tax returns? Well, if you favor a patriarchal/matriarchal form of government—that is, if you’re a liberal—you’ll probably see nothing wrong with such an expenditure, any more than you’d fault supplying free needles, free condoms, free diapers, and free services to those who have illegally trespassed into this nation and seek to resist efforts to boot them out. To those of a more sensible bent, the question arises: why should the county provide no-cost tax preparation services in competition with private industry? Under what theory could this plausibly be a proper county function? Even if you would countenance spending county funds on such a project, how would you regard a decision of the Los Angeles Chapter of the California Society of CPAs entering into a contract with the county to provide these services, at various sites, in return for a modicum of cash? Where a professional association participates in a government program by giving free services to members of the public, without proof of indigence—thus deterring these people from going to members of the profession and paying for the services—is this not directly contrary to the interests of the association’s members? Would participation by the United Food and Commercial Workers Union, AFL-CIO, which represents barbers, in a county project to teach people how to cut their own hair, not be moronic? Would this not be akin to the American Culinary Federation Chefs de Cuisine of California, Los Angeles Chapter, giving out secret recipes of chefs who are members, without their consent, pursuant to a county “cook-it-yourself” program? And where is this leading? The county is providing none of the programs set forth above. Well, at least not that I know of. However, the Los Angeles County Bar Association’s Board of Trustees does have before it a staff request for authorization to respond to a county request for proposals. If it files a proposal and it’s accepted, LACBA would take over the Self-Help Legal Access Center program under which it would provide assistance to pro pers in civil cases in filling out papers and advising them in connection with courtroom self-representation. 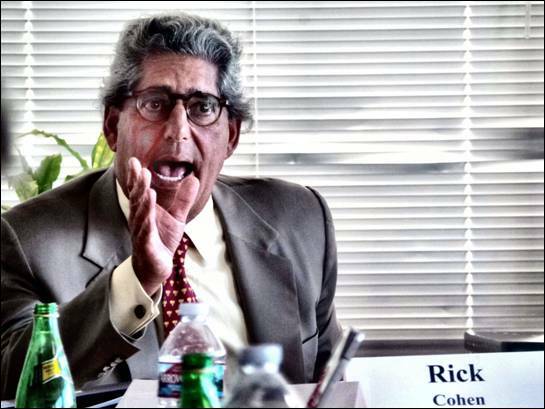 LACBA’s interim Chief Executive Officer Rick Cohen sought to push approval through last Wednesday night at the trustees’ monthly meeting, but there was some opposition. Michael E. Meyer, LACBA’s new president (as of July 1) expressed concern over potential liability to LACBA in connection with giving advice to pro pers, and President-Elect Brian Kabateck questioned whether undertaking such a major project would not divert attention from other matters upon which focus must be centered in this period of transition. It is in transition from idiocy—with interests of the membership subordinated to a support of charitable programs, but with the association’s financial reserves being drained, in the process—to a return to fiscal responsibility and responsiveness to the members’ needs. Cohen’s proposal, which will be taken up again, on July 25, in a telephonic conference, doesn’t quite fit in with the reform movement’s objective of the association returning to its core task of serving lawyers. What LACBA’s temporary CEO wants authority to do is try to land a contract that would entail hiring 11 lawyers and eight-or-so paralegals to give free advice to pro pers. The county would pay LACBA, and it would, according to staff expectations, net about $200,000 a year over a five-year period. The effect of such a program is, of course, not only to provide services to those laypersons who are bound and determined to represent themselves, no matter what, but inevitably to encourage litigants not to hire a lawyer, as they would otherwise do, assuming financial ability, if these free services were not available. According to the Superior Court’s website, “Walk-in parties are assisted in person on a first come, first serve basis.” Walk in, and get help. While 11 lawyers would get jobs with the program, newer lawyers who are sole practitioners, and who typically handle less complicated matters, would be denied bread and butter. The program does already exist, and will continue to exist whether LACBA participates or doesn’t…but should a bar association be involved with an effort that encourages people not to hire lawyers? Los Angeles County Bar Association Interim CEO Rick Cohen addresses the Board of Trustees. Even with the pro pers’ papers being filled in more competently by virtue of professional assistance, it would still be the pro pers making the appearances. There are no doubt those who would be too baffled by the process to know what papers need to be filed and how to do it who would go to a lawyer at the outset if the free service did not exist. But it does exist and, once having received front-end help, and told what to expect ahead, would these litigants not suppose they had the capacity to represent themselves in the courtroom, while, in all probability, they didn’t? One of the greatest frustrations judges complain of is having to deal with lay pro pers, ignorant of the law yet convinced of the right to prevail. Seldom do these self-represented litigants win if there’s a lawyer on the other side, though their causes might, actually, have merit. A judge can’t become their advocate, give them legal advice or otherwise accord deference to them. The judge must simply endure what are typically adamant and sloppy presentations. There are legal aid programs and low-cost clinics in Los Angeles County that provide help from lawyers to litigants with scant financial resources, which include representation in court. Those lacking in funds who need to sue or are being sued ought to turn to those resources. Yet, someone with a low income who is a party to a dissolution of marriage, custody battle, or other family law matter might well rely on the county’s free advice service rather than going to an outfit like Levitt & Quinn that provides start-to-finish representation. Too, there is no reason to facilitate efforts of tightwads who have the financial resources to hire lawyers, but don’t. It would obviously be contrary to the financial interests of LACBA’s members for LACBA to be involved in this. Meyer’s instinctive concern over potential liability is seen, from an examination of the RFP (not provided by Cohen to the trustees), to be well grounded. The RFP says that the program’s “employees and volunteers shall not dispense legal advice….” Yet, it provides that those assisting “patrons” are to “provide neutral counseling and educate patrons concerning the laws relevant to their case.” If there is counseling on the law that is directly pertinent to the case, how can this not be the giving of “legal advice”? Use of the word “neutral” does not obviate the necessary conclusion that advice given on the law in the context of a particular case is legal advice. The RFP denominates those receiving the advice as “patrons.” That term is generally applied to regular customers of a business, and seemingly inapt in this context, but aside from that, those being advised, no matter how denominated, surely are going to regard themselves as clients. And clients do tend to sue lawyers when they don’t win. Advising both sides, even if not a conflict, is perilous. The side that loses is bound to think that the other side got better advice. “CONTRACTOR shall recruit volunteer attorneys, paralegals, law students, paralegal students, college students, and community volunteers to assist patrons,” the RFP instructs. If persons other than lawyers are advising “patrons” with respect to the law, the activity is quite likely to cross the line into unauthorized practice of law, something with which LACBA should not be associated. Cohen’s request was not an agenda item. A poop sheet on the program was handed out at the meeting, rather than being an attachment to the agenda. To his credit, it was Cohen who suggested postponing action on the request after Meyer alluded to possible liability. Nonetheless, his bringing up a matter not announced in advance and seeking immediate action on it does point to a problem as to his approach, an approach reminiscent of the ramrodding that was all too prevalent in LACBA in a recent administration. Cohen also brought up another matter that wasn’t on the agenda which I’ll discuss tomorrow.